Loading/Filling your magazines doesn't have to be difficult. The task of inserting cartridges into a magazine can sometimes be difficult. 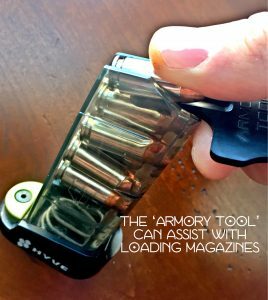 I wanted to help those of you who struggle with filling your magazines, by putting together a little how-to and include some tools that can make the task easier. It's probably good to start with correct terminology. Magazines are by definition different than clips. A magazine holds individual rounds in a tube and feeds them automatically through spring tension. Alternatively, clips hold multiple rounds together as a unit, and that unit is manually fed into the gun. Pistols use magazines, while some handguns like revolvers use clips. Most rifles, like your AR15, use magazines, while some use clips, like the M-1 and Mouser. Damage do the magazine feed lips can lead to feeding problems in your gun. Some other helpful magazine nomenclature is worth mentioning. For example, the magazine follower is the plastic insert that is pushed up by a spring inside the magazine. you can see the follower at the top of the magazine when it is empty. Feed lips are the tabs on either side of the magazine opening. Damage to the feed lips will almost assuredly cause feeding problems. And let's mention double stack vs single stack magazines. As the name implies, a single stack magazine holds the rounds in one verticle column inside the tube. A double stack, staggers the cartridges creating two columns. With this clear Glock27 magazine from ETS, you can see how the cartridges stagger inside a double stack magazine. Ensure you have the right ammunition. I have seen the improper ammo loaded into a magazine by accident, and it's probably more common than one would think. Next, identify the front of the magazine. The feed lips of the magazine will indicate the rear of the magazine (see photo). When loading the first round, hold the round in line with the magazine follower. Press the rear of the round onto the follower. Depressing the follower until the cartridge can slide completely into the magazine. For all subsequent rounds, use the thumb of the hand holding the magazine to push down on the top cartridge in the magazine. While pushing down with your thumb, use the back portion of the next round to push down on the top cartridge. Once the round depresses far enough, seat it by sliding it to the rear. If you have a .22LR semi-auto, you may have a tab on the side of your magazine. The process to fill these magazines is essentially the same. The difference is that the tab allows you to pull the follower down so you don't have to push on the cartridge for each round. As the magazine is filled, the spring depresses and filling more rounds becomes more difficult. New magazine springs are stiff, especially for smaller guns like the M&P Shield, Beretta Bodyguard, and Ruger LCP. Don't worry, over time the springs get broken in, and after time, your hands will get stronger and it won't be so difficult. 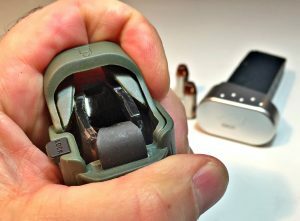 For those who have difficulty, or an injury that hinders their ability to load their magazines, there are some nifty devices that help. If you're filling hundreds of rounds in a range session, these gadgets will also save your thumbs from blisters. I'll cover these in a minute. How many rounds is enough? I recommend filling your magazines to capacity. Some say that this can cause problems with feeding. I have never experienced a problem where a fully filled magazine didn't feed properly. If you experience this, perhaps it is a problem with the magazine. Some magazines have witness holes on the backside, that let you see how many rounds are inside. Note about capacity: with my everyday carry gun (EDC) I fill my magazine to capacity, chamber a round, and then top off the magazine with an extra round. This raises my capacity by one. 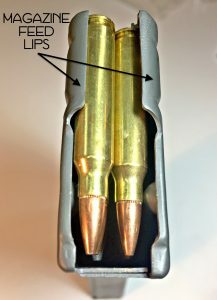 Some guns function fine with this process, however, some people have had feeding issues caused by the pressure of a full magazine and a round in the chamber. I have never experienced this with several different guns of various manufacturers. But you should test this out on the range before you carry like this. The most intuitive way is to hold the gun in your dominant hand. With the gun pointed in a safe direction, rotate the gun so your palm is facing up. Deliberately insert the magazine until it is fully seated. You may or may not hear a click when this happens. Do not be scared to use force when doing this. You will not break your gun and a firm strike on the base of the magazine will ensure it's seated properly. Rotate the gun with your palm facing down. Pinch the slide with your thumb and index finger. Pull the slide completely to the rear and let it go, like a slingshot. 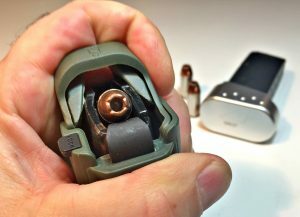 Do not ease the slide forward, this will cause the slide to not fully go forward into battery and chamber the round. If the slide is already locked open, you can use the slide stop to release the slide and chamber a round. The biggest reason I don't typically use this method is that I have seen some slides not go fully into battery. It could have been caused by the type of gun/ammo combo or a host of reasons. But the fact is I have seen it happen more times than I am comfortable with. Grasp the slide over the top with your non-dominant hand. Pull to the rear with your non-dominant hand, and push forward with your dominant hand. Release the slide and let it move forward on its own. To remove rounds from a magazine simply strip each one off toward the front of the magazine. You can use your thumb or the backside of another cartridge. Each time you remove a round, the next one will move up and you can remove it the same way. 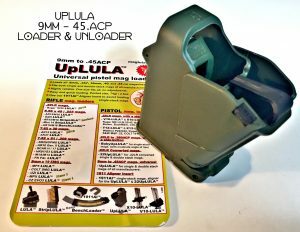 The UpLula Mag loader is incredibly easy to use. 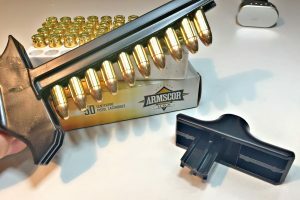 Not only does it make loading magazines with tough springs a snap, it speeds the process up and keeps your thumbs from getting blisters if you're loading a lot. This is one of the devices made by the Maglula (Magazine loaders and Unloaders Accessories) company. 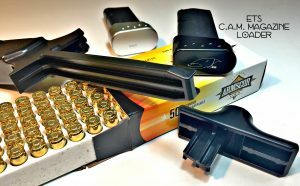 They simply make devices that make the loading and unloading of any handgun or rifle easier. 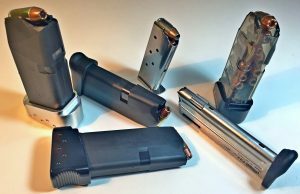 The Uplula is for single or double stack, 9mm through 45.ACP magazines. I consider myself old school and don't mind a thumb blister from a good range session, but I absolutely love this thing. It is simple to use, solidly constructed and compact. The device presses down on the follower and allows you to drop each round down into the magazine one at a time. 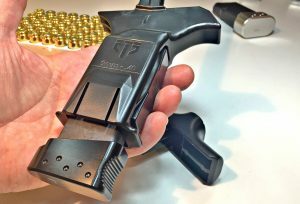 It undoubtedly makes it easier and faster to load a magazine. The device is not cheap at around $30.00 but if you struggle to fill your mags, this device will change your life. And just between you and me, I think I like this thing the best for loading my handgun mags. Slide the device over your magazine. Squeeze, so the tab inserts into the mag and rests on the follower. Then press down. Drop a round into the magazine. Relax your grip and allow the tab to slide out of the magazine. Raise up the device, insert the tab on top of the round and press down. Elite Tactical Sytems (ETS) is the company that makes those sweet clear Glock and AR magazines you've seen. They also produce a couple different speed loaders for handguns and AR's. The loader I have is the 9mm through .40 cal loader. This loader tackles the issue of filling magazines differently than the UpLula. The magazine is inserted into the CAM Loader. The device has a rail that allows you to slide up to 10 rounds on it, directly from the box. A handle is slid over the rail and pushed down toward the magazine. This forces the cartridges into the magazine very quickly. It takes a bit of getting used to, but once you master it, you will be loading magazines in a flash. The C.A.M. loader from ETS allows you to load your magazines super fast if the ammo is coming directly from the box. Insert the magazine all the way into the CAM loader. Use the long tab to pick up to 10 rounds directly from the box. Then use the pushing tool to force the rounds down into the magazine. This plastic multi-tool is slim enough to fit in your wallet. In addition to a 1911 bushing wrench, the armory tool has a tab used to assist in loading the magazine and one to help unload. The loading tab has a groove that the cartridge sits in. Using the tab to push down on the top cartridge, instead of the round you are trying to load, helps with leverage and makes it easier to insert the cartridge. The hooked, tab end of the gadget is used to easily strip the rounds out of the magazine. 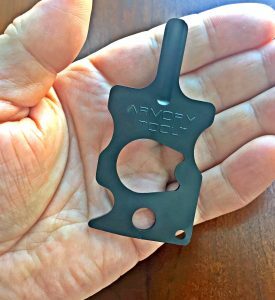 The armory tool is a simple multi-tool that can aid in loading and unloading of your magazines. Using the Armory Tool to load or unload your magazine is quite simple. This is another device from those geniuses at Maglula. 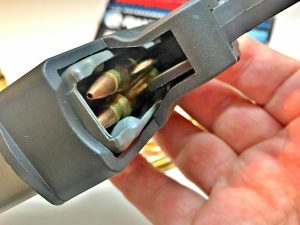 Unless you have the old speedloaders and your 5.56 ammo is coming on stripper clips, every Ar15/M4 owner is going to love this! Sorry gun hating states, but 30 round magazines for your AR15/M4 are the standard, and we like to have lots and lots of magazines. Filling an AR15 magazine is something I will never tire of. For some reason, I find it satisfying. That being said there are some times that you want to just load with a quickness. You can do it with this device! It locks onto the magazine and you move a lever back and forth allowing you to easily drop a round into the magazine. If that weren't enough, this thing unloads the magazine like nothing I've ever seen. 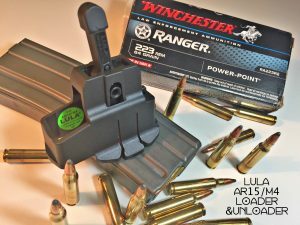 Manually unloading your AR15/M4 magazine is not as smooth as unloading a handgun magazine. 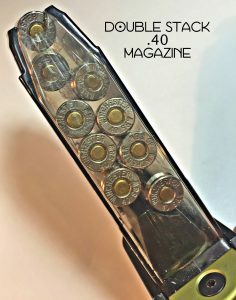 With this device, you turn the magazine upside down and move the same lever back and forth, and 5.56 cartridges begin to rain down from the magazine. This gadget is an incredible piece of engineering. If you shoot a lot of 5.56/.223 this guy will become your best friend. Once you lock the device onto the magazine, simply rock the lever back and forth. This allows you to quickly load or unload the mag! Note: The Maglula loaders operate in a way that doesn't require the feed lips to be depressed. So theoretically, your feed lips will not be worn down by the manual loading process. Along the same line, some have questioned if the CAM Loader from ETS would damage the feed lips. ETS has stated that using the device will not damage your magazine's feed lips. The device fills the magazine in the same manner as you would by hand, just much faster. So while it doesn't seem it would reduce wear on the feed lips, it won't damage them any more than loading by hand would. Check out the included video, where I show you exactly how these devices can save you time and frustration filling your magazines. I kept my Rugar P85-MKII 9mm pistol factory loader that it came with after selling the Rugar. 9mm. It fits and works perfectly with my KelTec-P11 9mm pistol! I had neck fusion several years ago from a wreck and I still have a certain amount of weakness to my hands from this injury. This is a simple little stamped steel loader tool I now use to load my Kel Tec, why don’t more pistols come with this little device for loading or unloading the mags, it’s certainly cheap to make and very easy to use? I load my magazines with a 10-inch dowel rod and a 1/8″ Phillips screwdriver. I use the dowel to push the follower to the bottom of its travel, then insert the screwdriver into a witness hole above the follower. I simply then insert the rounds into the magazine, then pull the screwdriver out. Voila! Easily loaded mag with no strain on thumbs. Works with AR-15, Hi-Point and other magazines. What type of gun is a mouser? Is it for killing mice? Pretty sure its a Mauser because the company was started by Wilhelm and Paul Mauser, its a German name. Just saying, don’t blow my head off with one of your hollow points. Leave a Reply to Jimmy Rifle Click here to cancel reply.